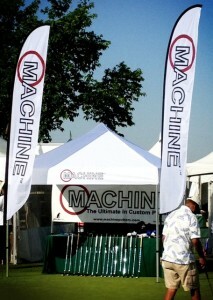 MACHINE Putters were conceived and developed with the goal of providing the very ultimate in quality and precision, advanced state-of-the-art design and technologies, and the most creative and beneficial options for user adjustability, customization and personalization. Dave Billings starts the design process by creating and inventing a platform concept with new technologies that he believes pushes the envelopes of design and performance. A platform concept or technology is one that can be applied across multiple models or even product lines. Dave usually begins the design process with hand sketches and then goes about designing everything in much more detail in advanced CAD (Computer Aided Design) software. Once he is satisfied with the look, shape and dimensions, those designs are then transferred into the company’s CAM (Computer Aided Manufacturing) programming software operated by Mike Pelto, Dogleg’s Machining Manager. Mike and Dave then meet and confer on details including what tools and fixtures are needed, how they will hold and mill the parts as they are created in the milling process, and what tool paths should be used to create the best surfaces, blends and finishes. The details of the design and the machining are critical to making beautiful, high quality parts that perform as intended, and therefore hours of work go into these steps. Then the first prototypes and test pieces are milled from scratch on the company’s own Haas CNC machining center. New designs are inspected and checked for quality control each and every step in the milling process, and each cutting tool and pass is checked, tweaked improved and dialed in to achieve the best possible result. Multiple high quality cutting tools are used for each operation, selected for the best fit and finish, not the fastest or cheapest way to cut away the excess metal away. 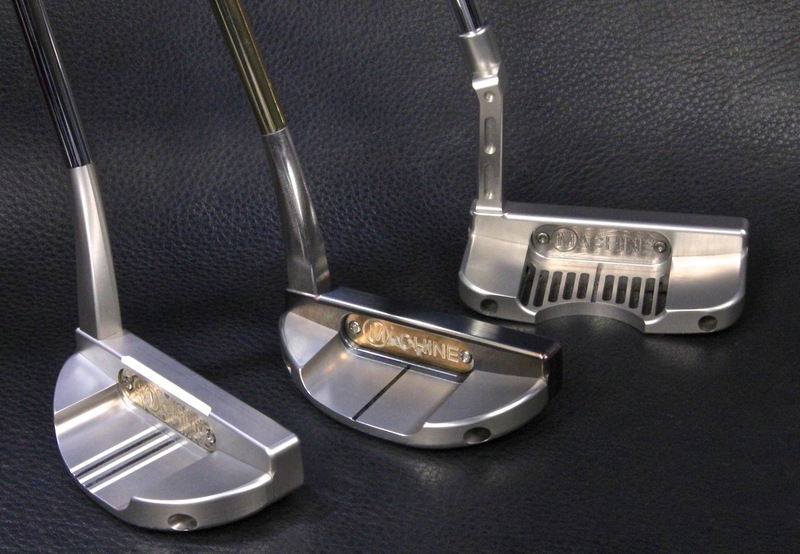 This meticulous attention to detail is part of what sets MACHINE Putters apart from the competition. Where other shops may cut corners, take less passes or use less expensive materials or tooling, or less complicated fixtures, Dave, Mike and the entire team here always work hard to design, use and make the best! This development process has been refined to a high degree of design creativity and engineering with decades of expertise, combined with an intense passion for perfection, in a process where quality, art and performance all merge to make the ultimate products possible. In the end, when everything is developed exactly as Dave and our team want, raw billets and bar stock of the highest quality metals are transformed over hundreds of steps in the machines and by hand into beautiful, functional works of high-performance golf club art. Much of the creative and custom work also entails prototyping and modifying pieces with old-school machining and turning on the company’s Bridgeport manual mill and Hardinge Tool Room lathe, milling and turning parts that others might shop out, buy off the rack, or even do without. Not at Dogleg, where all proprietary head components are made in-house to ensure the quality and consistency they and their customers desire and expect. We even make our own threaded weights, to ensure their quality, consistency, fit and finish. The custom work Dogleg is doing with MACHINE Putters today goes well beyond what is available from any other maker in the industry. This is a testament to Dave’s creativity, drive and leadership, and our entire team’s talents and experience with the equipment and tools of the trade. 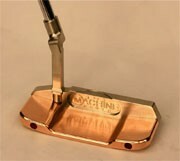 Whether it is a Pinstripe putter with dozens of hand milled pinstripes on the surface for better alignment, or a Deep Bite Bongo Back with intricate and complex 3D milling to redistribute weight and increase alignment, this work is usually instantly recognizable as pure MACHINE, and also seen as not only creative, but super functional and ultra-high quality. Precision milling is only one step in the process however, and what comes next is also a hallmark of Dogleg Right’s pursuit of perfection. While may competitors outsource their milled heads, and then ship them off to another industry supplier to finish them, Dogleg again takes the extra care, pride and ownership of their product to do their own hand finishing and detail work in-house. Dave and his team have been known to spend hours upon hours on a single head to get it exactly the way he and our customers want. We think it shows in the end product, and hope you do to.